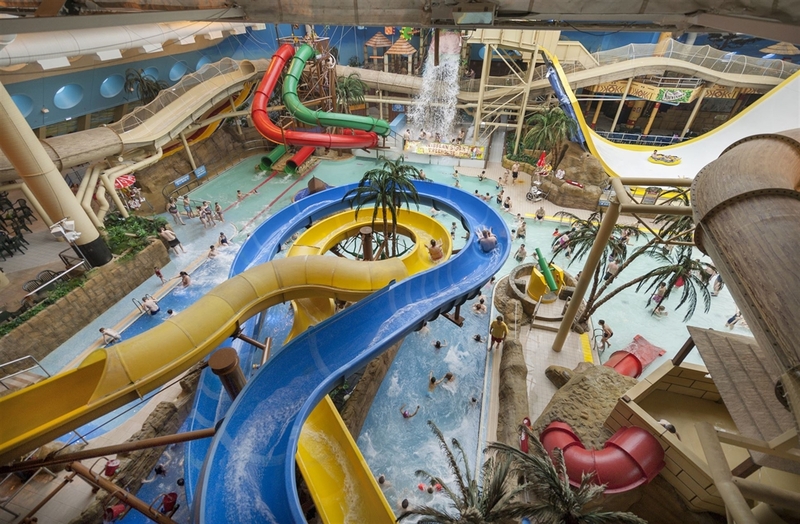 Sandcastle Waterpark Blackpool is the UK’s largest Indoor waterpark. With over 18 slides and plenty of exciting attractions in an 84-degree tropical climate, there is something to entertain the whole family. The waterpark boasts four more impressive slides that can be accessed with a Hyperzone Wristband. It’s an additional price but well worth it for the thrill seekers in your group. Slides featured include two Aztec themed slides, which launch from high up on the waterpark’s roof, venturing outside and then sweeping back into the building before hitting the water. The first – Montazooma – is a colossal mat slide with 360° loops and back-to-back turns, while the second – Aztec Falls – involves an electrifying pitch-black descent into a giant bowl. Families can add these slides to the list of thrill slides like Masterblaster, the longest indoor rollercoaster waterslide in the world, and Sidewinder, which was the world’s first indoor vertical waterslide. There’s plenty to entertain the whole family and those who don’t fancy the bigger thrills: whether it's relaxing in the free-flowing Ushi Gushi Action River or Thunderfall’s long but relatively gentle twisting slides. There’s also the faster pace of the Duelling Dragons, the tranquil Shimmering Shallows and the ever-popular Typhoon Lagoon Wavepool to check out. Younger explorers will love the Caribbean Storm Treehouse, which is an interactive adventure play area with a giant tipping coconut that cascades over 600 gallons of water over unsuspecting victims. The fun doesn’t stop there. Everyone can expend a little energy using the water cannons, mini slides and jets at HMS Thundersplash and Fort Riptide. Cashless Splashcash Wristbands make it easy to pay for food and drinks when inside the waterpark and can be purchased in advance or on the day - this means you can leave your wallet in your locker and is one less thing to worry about! At an additional cost, guests over 18 years old can enjoy Seabreeze Spa, which features a steam room, sauna, salt inhalation room, aromatherapy room, foot spas, ice feature and heated loungers. Our new VIP Cabana is perfect for guests looking for an an all-inclusive day out. You’ll enjoy your own private area, which includes a lounge area with TV, plus a separate dining area with lunch for all guests included – all overlooking the rest of the waterpark. You’ll also get to relax in your private hot tub and take refreshments from your fully-stocked bar (which also includes soft drinks!). There’s also a handy private car parking space and admission to all areas of the waterpark including Hyperzone and Sea Breeze Spa (height, weight and age restrictions apply). Our VIP Tiki Cabana is perfect for special occasions, celebrating with friends, or a birthday treat for the whole family. For prices and availability, please call 01253 340700. The Sandcastle Waterpark Team is committed to Guest Service Excellence and Tourism for All. For more information and to book online to guarantee your entry and beat the admission queues, please visit the official Sandcastle Waterpark website.